Yet another September 11 has passed, and it's hard to believe that its been 12 years since the horrifying destruction of the iconic Twin Towers. As most New Yorkers I know who were here when the attacks occurred, I remember the day well as if it were yesterday. Even though the World Trade Center is no more and a new Freedom Tower is rising into the sky to take its place, relics from the short life of those gleaming wonders still exist, even as far away as Kansas City, Missouri, where I discovered this pamphlet from the 1980s at a vintage shop called Westside Storey. 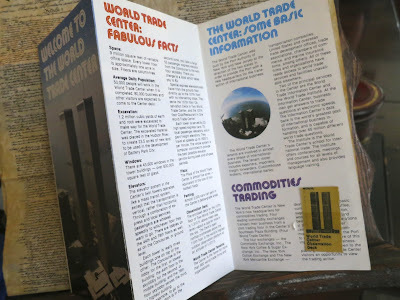 While I did not purchase this pristine piece of ephemera, I did marvel over its descriptions that were written when the New York city attraction was not even 20 years old. 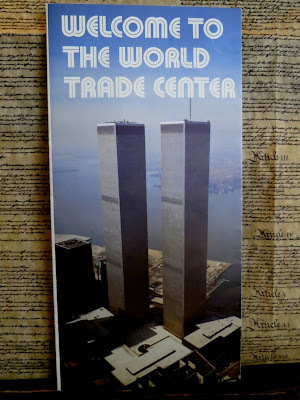 Back in the late 1980s and early '90s when I worked in the vicinity of the World Trade Center, I was inside the the massive complex almost every day, either taking a subway in its transportation hub, grabbing lunch in its food court or shopping in its underground mall. I never had the opportunity to dine in its glamorous Windows on the World restaurant on the 106th and 107th floor in the North Tower or visit its Observation Deck on the 107th floor of the South Tower. It appears that the person who owned this brochure made it to the outdoor viewing area, since the admission ticket remains stapled to the booklet's interior. 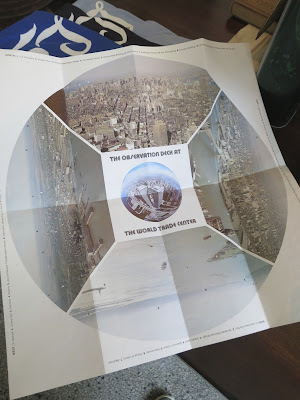 I am not a fan of extreme heights, but I can imagine the spectacular perspective visitors that visitors must have experienced, a sky-high view that took them all the way to New Jersey, Staten Island and across all of Uptown Manhattan, Brooklyn and Queens. Those views are gone and the New York City skyline has been altered forever. To this day, every time I catch myself looking in the direction of the Twin Towers, I still find it hard to believe they they have disappeared. I walk by the Chanel boutique in SoHo at least three times a week, but it wasn't until the other day that I stopped to look in the windows more carefully, only to realize that these glamorous, scalloped pillars are made with carefully warped vinyl LPs. Created by German artist Gregor Hildebrandt, the works appear both in the retail space and in the windows of the shop that the illustrious architect Peter Marino offered a re-do in 2010. Fanciful yet chic, the repurposed records maintain their grooves that not long ago would have transformed a turntable into a music-making machine. I love garage sales. I really do. I can't resist rummaging around in boxes heaped with old books and magazines, sifting through much loved linens or Christmas decorations and listening to the stories that accompany the objects that catch my eye. People always want to know what it is that I'm looking for when I am out thrifting, and the answer always causes me to stumble. For unless I'm shopping for a particular person or working on a project that calls for thrifty touches, I couldn't really say how I want to spend my dimes and quarters. I do know, however, that an object that comes with a heartwarming story or provokes a fond flicker from the past is one that will cause me to pause. Take, for instance, these little goodies procured from a garage sale in Independence, Missouri, that set me back a whopping $2.95. The retro napkin holder was marked down from $2 to $1 and will happily complement the mid-century dining table my sister bought me at a garage sale just down the street from my parents' house. 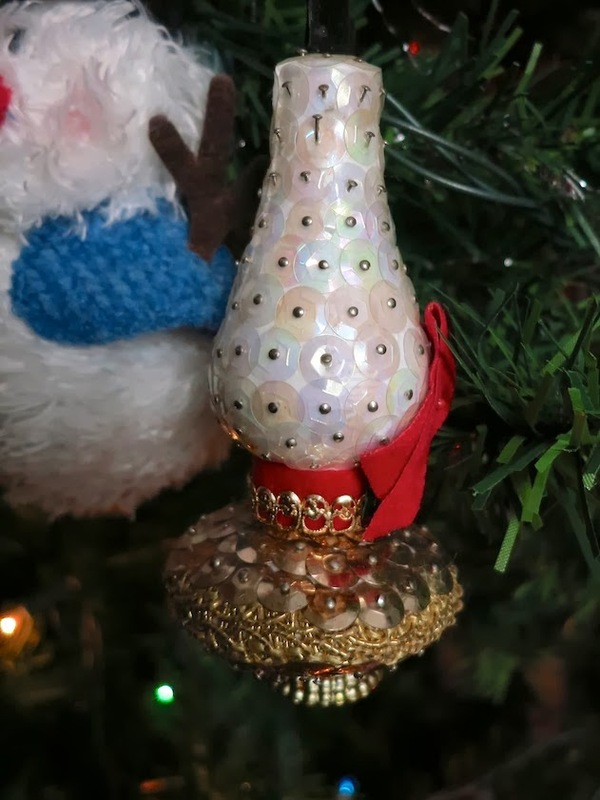 The 1970s paper snowman, at 25 cents and in perfect condition, also found his way into my heart. He reminded me of how my sister and I were always so eager to decorate the house for Christmas as soon as the Thanksgiving dinner table was cleared. The birthday candles from the 1950s were marked 5 cents. What are birthday cakes without birthday candles? No birthday in my history has ever been celebrated without some type of cake set aglow (more glowing in recent years!) with rows of candles just waiting to be blown out with a puff and a wish. The Ryman Auditorium refrigerator magnet for 15 cents brought back such memories of family vacations. One of our favorite places to go was Nashville, Tennessee. We'd load up the old Chevrolet Impala or Caprice Classic and head down south, where we would spend a day at the Opryland USA amusement park, take in the Grand Ole Opry and tour sites around town, some of which no longer exist: The Country Music Wax Museum, The Minnie Pearl Museum and The Country Music Walk of Fame. 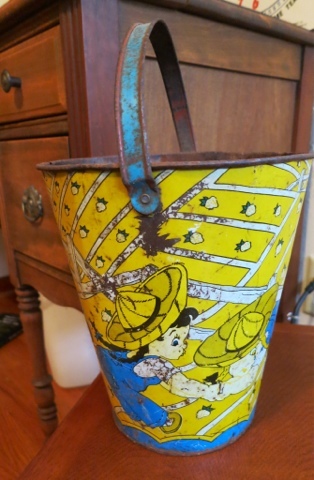 I added it to my other finds. After I made my initial purchase, I did another quick sweep and spied the Cake Breaker still in its original box and priced at $1.50. I asked the couple selling it about the serving utensil, and the wife told me how it was a wedding gift 60 years ago. "I think I used it three times," she said. "But a knife was easier." I couldn't resist, and counted out six more quarters. All these things are just things, you might say. And you're right. I realize that these objects have no real monetary value., but for me, they are priceless. These little treasures help me hold on to lovely memories of the past, especially of the people I love and of those who love me. And the next time I slice a cake, I'll think of this sweet, summertime garage sale. Put your fine crystal on a skateboard? That's what they did in the windows of the Parisian department store Le Bon Marché. 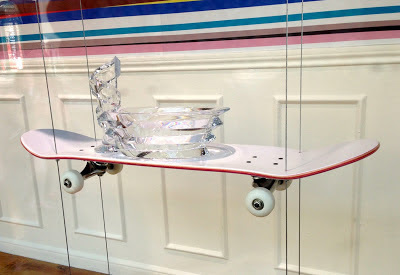 Let's just hope the skater doesn't take this shimmering piece on one of the cobblestone sidewalks of the Marais or try to pull off a kick flip on the banks of the Seine. Now that could be a crashing disaster. Mon dieu! I love loafing around, especially if it's in Paris, one of my favorite places in the world. The French have a word for someone who likes to loaf about -- one that sounds less lazy than the term we use here in the States. Le flâneur is the term that in French refers to someone who wanders aimlessly in a daze of wonder and awe, pleasantly biding his time wherever his path may lead. That describes me in Paris. When I'm at home, I'm usually running around with a mission. But not in the City of Light. Oh, its Métro is convenient, reliable and wonderfully clean, but you'll most likely find me, instead, on foot, taking in the winding streets of the Marais or making my way, park bench to park bench, through the gardens of the Tuileries, adjacent to the Louvre palace. And why rush? More often than not during my visits to Paris, I'm in no hurry to reach a destination, should I even have one planned, leaving my mind open to chance discoveries that I might otherwise miss if I were racing to get from point "A" to points "B," "C" and "D."
I had just ambled over from a lounge chair (much like the one you see in this photo) across the way, admiring the spring flowers. Before that, I was parked on a long concrete bench from which I watched a young mother and father maneuver a see-saw for their squawking tot. 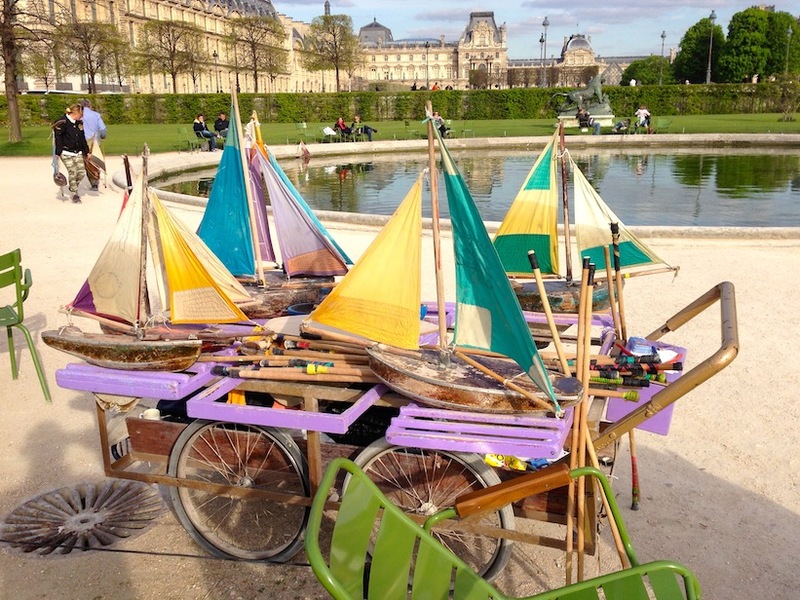 Take this cart piled high with sailboats, for example. Many times I have witnessed them bobbing gleefully in this pond in the Tuileries garden, but I've never actually seen them being collected by their caretaker at days' end. Stacked carefully on a wooden cart, the boats' time-honored patina is proof of their beloved status among the children who over the years have prodded them along through the water. 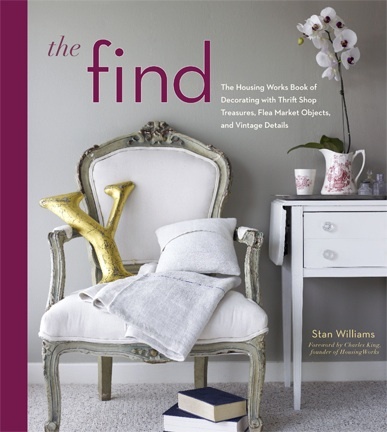 I ran a version of this post close to the date The Find launched four years ago. Enjoy! The Birmingham, Alabama, home Southern Living's Heather Chadduck, is a prime example of delving into imaginative uses for what might have been cast off by someone else. 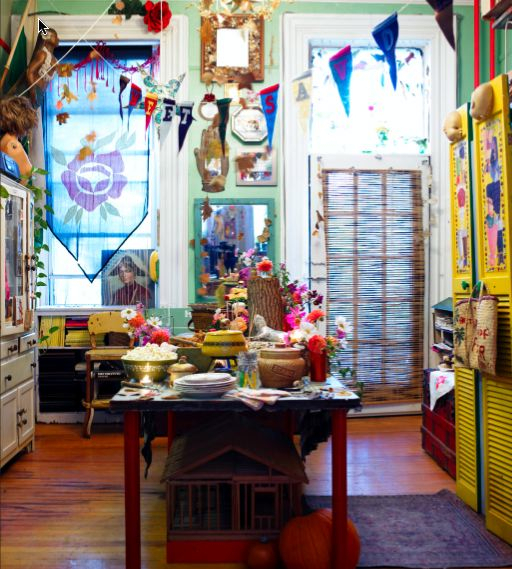 Her bedroom alone, which is featured in The Find: The Housing Works Book of Decorating With Thrift Shop Treasures, Flea Market Objects, and Vintage Details, and photographed by Jim Franco, has several brain-sparking stories to tell. Heather loves anything that is numbered, so when she discovered what she believes to be a key box at a flea market, she bought it, and then transformed it into a handy, yet appealing organizer for her collection of vintage jewelry. One of her prized possessions in the room is the toile drapery that she saved from the garage bin of a San Francisco hotel. She got the call from a friend who found out that the toile was being tossed, and Heather came to its rescue! Not only does it elegantly cover her windows, but it also adds charm to a headboard she fashioned out of the fabric and coordinating ribbons. 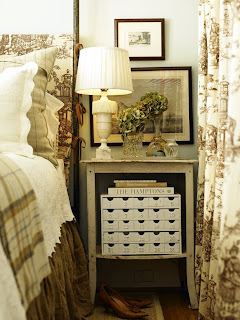 Dreaming of finding my own cache of brown toile! The Object of My Desire: Shake It! You'd have to be made of stone to not let this scenario allow you to crack a smile. 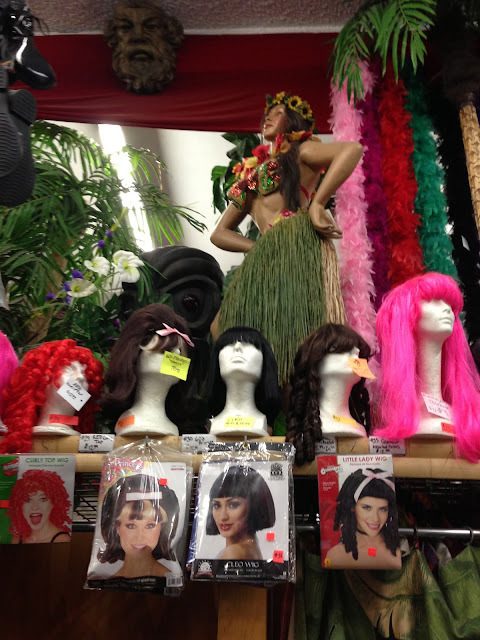 Wigs: I cannot get enough, especially this mixture of a Cleopatra style, crazy clown curls, a neon pink do and a Cher banged number, all perched on a shelf at Hollywood's costume and vintage shop Ozzie Dots. If that weren't enough, just raise your gaze up to the hula girl in a grass skirt, a sequined bikini top and a sunflower headband. Oh, and let's not overlook the tiki god. He's hiding out behind a Hairspray-style bouffant. I ran this post a while back, but since we're on the theme of party planning this week, here's an idea for a fun hostess gift. 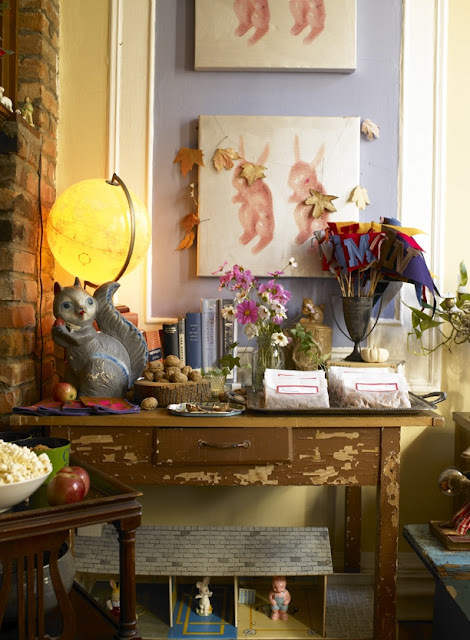 When Michael Quinn and Heather Kerr hosted an indoor tailgate party to be photographed in The Find: The Housing Works Book of Decorating With Thrift Shop Treasures, Flea Market Objects, and Vintage Details, I found out in the planning process of our shared adoration of Dolly Parton. So when it came time to give them a hostess gift, I used my country music muse as inspiration to craft separate host and hostess gifts that didn't cost much, that I would enjoy making and that they would like receiving! For both, I found two jelly jars that I would pack with candy, and put some sort of Dolly memento of which I have plenty. For Heather, I chose this pendant that was once part of a key chain I bought at Dolly's "Alive and Well. " I chose this for Heather since she is a fabulous jewelry designer and might be able to refashion it into a Dolly-riffic piece to wear once she finished off the Hot Tamales that filled the container. As for Michael, I made a photocopy of the cover of Dolly's "Jolene" album, and placed it among multi-colored Mike and Ike's. Since Michael is such a fashion plate, I found a coordinating bow tie in my closet and wrapped it around the container like a ribbon -- one that Dolly herself might have tied around one of her wigs in her younger years. Reuse & Repurpose: Nuts to You! Repurposing what you have on hand can help you create party one-of-a-kind party decorations that guests will talk about for years to come. Here's one of my favorite images from The Find -- one that Michael Quinn crafted for an indoor vintage tailgate party. Here, an illuminated globe and a garden ornament transform into a whimsical centerpiece that delights the eye and accents an evening full of fun. 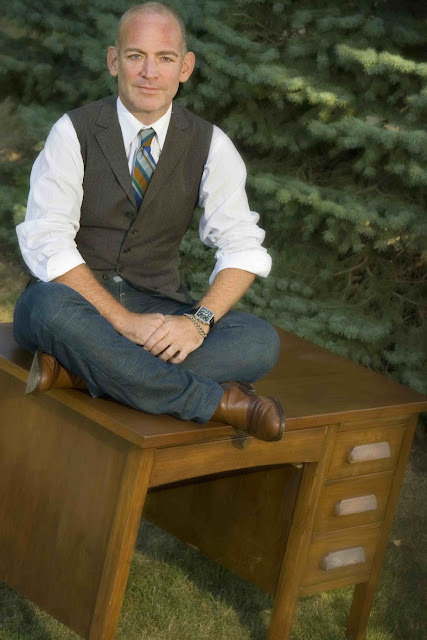 Today, you can win a personalized event-planning consultation from Michael and me. Tonight, The Sustainable Classroom Project, is auctioning off our services to help raise funds for the Advancement for Rural Kids, an organization that promotes getting kids get back to school in developing parts of the world. You can buy a ticket to the event, here, or join in on the silent auction to win Michael and me for a few hours and receive a signed copy of The Find. 1. Set your budget. Even for the smallest home gathering, knowing how much money you can spend frees your mind to get creative. It is also a good way to help you prioritize the what you can live without and what is a must-have. 2. Pick a theme. This theme -- a color, a person, a time of year, a place a type of dog a TV show, or whatever -- the invitations, the menu, the music, the decoration and the dress for your affair. I once threw what I called a Dolly-Rama, a celebration of all things Dolly Parton. My good pal Michael Quinn is infamous for his Christmas celebrations with themes that range from "Mexican Christmas" to "Christ-mystical." 3. Use what you have for unexpected décor. Raid your kitchen cabinets, closets, bookshelves and friends' and neighbors' cabinets, closets and bookshelves for interesting objects that will personalize your event Mix and match your dishes and flatware for an eye-catching tabletop. Use a crazy piece of art or statuary as a centerpiece. Decorate your space with miniature floral bouquets in juice glasses. Let your imagination roam, but stay within your theme. 4. Plan your music. Everybody know that when the liquor is flowing and the music is just right, then that's half the effort of having a party that nobody wants to leave. Select music to complement your evenings' theme. Music that pops up randomly from a playlist can ruin the mood of all your hard work. 5. Offer a parting gift. I often keep a set of mismatched vintage dessert plates on hand for guests to fill up and take home. I don't worry about getting the plates back, and party goers gain a memento of our time together. Michael often creates handmade jewelry in the theme of his parties that guests wear right out the door! Now's your chance to win a private event-planning consultation from Michael and me. Tomorrow night, The Sustainable Classroom Project, is auctioning off our services to help raise funds for the Advancement for Rural Kids, an organization that promotes getting kids get back to school in developing parts of the world. You can buy a ticket to the event, here, or join in on the silent auction to win Michael and me for a few hours and receive a signed copy of The Find. 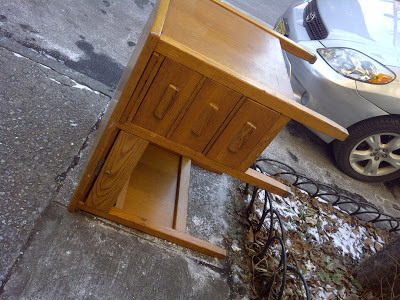 This image of a vintage tinged tabletop from The Find remains one of my favorites. 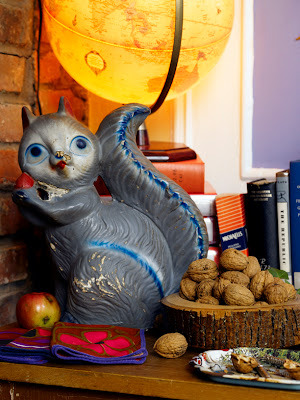 I love the mix of unusual objects -- a weather-beaten squirrel, an illuminated globe, a dollhouse and a peeling dresser -- that serendipitously come together to celebrate an indoor tailgate party thrown by Michael Quinn and Heather Kerr. If you've ever wanted a private event-planning consultation from Michael and me, now's your chance. The Sustainable Classroom Project, an event on April 11, is auctioning off our services to help raise funds for the Advancement for Rural Kids, an organization that promotes getting kids get back to school in developing parts of the world. Buy a ticket to the event, here, or join in on the silent auction to win a signed copy of The Find, a perk for the top bidder of Michael's and my sure-to-be-unique and most-certainly-entertaining party consultation. I admit it. I have a lot of stuff. While some people pride themselves in their minimal, stark sensibilities with bare walls and barren surfaces, I like my things around me, not because they have some kind of monetary value, but they do remind me of people and places I love. Take, for instance, my crowded china cabinet -- the one that came with a dining room set that my sister bought me for $140 at a garage sale in Independence, Missouri. Oh, yes, it's pretty full with objects, but each one has a story that I will remember forever. I found the Little Red Riding Hood cookie jar on the top and the Old MacDonald pitcher below it at a pair of Santa Monica garage sales; the bright yellow tureen came from the Community Wide Garage Sale in Point Pleasant, New Jersey; there's a copy of my labor of love, The Find, on the bottom shelf right next to a handmade, ceramic bowl from Croatia; and there are two identical bean pots. Two, you might ask. Isn't that excessive? Maybe, but I'll tell you how that happened. A few years ago, my mom mailed me the bean pot that she and my dad received on their wedding day more than 50 years ago. Wrapped in a couple of paper towels and packed in a flimsy box, it's a miracle that ceramic pot made it to my door without being smashed to bits. I have treasured that bean pot over the years, so much so that it appeared on the pages of The Find in a tablescape created by Michael Quinn and Heather Kerr. I kept the bean pot in my kitchen underneath a kitchen shelf overburdened with stuff, which, cause it to come loose from the wall and smash into my beloved bean pot, breaking its lid. I was crushed. I collected the pieces of my broken pot then immediately went to Etsy where I quickly found a pot with the same markings. The plan was to take the lid from the new one to replace the broken one, which I would glue back together and place on the one I found on Etsy. After a few days, my package arrived and when I picked it up, I heard the heart-sinking sound of broken pottery. I held my breath as I carefully opened the package, only to reveal a pot that was cleanly broken in three pieces. Rats! But the good news? The lid only suffered a tiny nick, and the seller felt so bad about the damage that she refused to let me pay for it. I put my new lid on Mom and Dad's bean pot and glued all the broken pieces together to "Frankenstein" another entire pot, leaving me with two identical bean pots that hold in them a memorable story. Having come home to Independence, Missouri, on a quick visit for my dad's birthday, my time was limited, but not so much so as not to experience a first: a visit to the Goodwill Outlet in Kansas City. I had no idea what to expect, other than the advise my sister gave me: go into it with an open mind. Mind open and change burning a whole in my pocket, I was ready for an adventure. We started sifting through rows of blue bins,considering the array of odds and ends that were priced by the pound: aBilly Idol tape; a silly magnet; a Lego toy attachment. We were just getting warmed up when an announcement came over the loud speaker alerting the crowd that rows 9 to 11 of the blue bins were about to be swapped out, and to stand out of the way as workers removed the old and hauled in the new. Container upon container glided into the room, and shoppers stood back just as they had been requested. Finally, all the merchandise was in its place, and a worker announced that the treasure hunt could proceed. The frenzy resumed over the new bins as people grappled over pairs of shoes and cartons of china. I picked through a box of dishes that looked like it had been dropped off directly from a garage sale, as many of the objects still had masking tape price tags attached. I salvaged a mid-century candle holder and a vintage, glass juicer. Window shopping is the most economical way of filling your imagination with all kinds of goodies and spending nothing at all. This display in the Marc by Marc Jacobs windows on Bleecker Street is infested with oversized ants gobbling up goodies at a fantasy picnic celebrating the arrival of springtime. It appears that these rambunctious critters are about to haul this elegant, mannequin atop her blanket back to their communal ant hill. Talk about ants in your pants -- and in your dress, too! A few weeks ago as I was walking near my apartment, I spotted this solid wooden teacher's desk in perfect condition sitting by the side of the street. I posted its image on Facebook with its location in hopes that someone would see it and come to its rescue. I didn't, however, mean to alarm my friends who thought I had tossed out a desk that my father helped me refinish many years ago and that Kansas City photographer Bob Greenspan photographed, with me on it, for The Find: The Housing Works Book of Decorating With Thrift Shop Treasures, Flea Market Objects, and Vintage Details. I think I paid $10 for the piece of furniture at Goodwill and then went home to ask my dad to help me haul it home. Either way, he helped me re-finish it and I took it off to the University of Missouri where it was the sturdy surface for typing many a college paper or for laying out magazine design projects. When I moved to New York, space prohibited me from taking it along, so it continues to reside with my sister where it remains completely happy in her home office. Anytime I'm at a flea market or in thrift shop, I can hardly keep myself away from a table of postcards where I can literally spend hours enjoying each and every souvenir. I hardly ever buy, but when I do, it's usually a card depicting a place I've traveled and is always blank on the reverse, so I can send it to someone else. Also, I will never pay more than $1 for a card, unless it has something absolutely irresistible on it, such as an image of Dolly Parton from the '70s or a photo from Worlds of Fun when I worked there in the 1980s. My favorite cards are ones from France, such as these two cheerful examples from Paris that I picked up in a junk shop in New Jersey. While Paris, just like other big cities, is experiencing much change, the monuments on these cards appear as they do today: the Luxor Obélisk at place de la Concorde, l'Arc de Triomphe, le Sacré Cœur, la Tour Eiffel and Nôtre Dame de Paris. And even though progress is now diverting traffic around the place de la République for a pedestrian mall and the Marais is becoming littered with chain stores, this magical city retains the thrill and familiarity that I have known and loved for more than 20 years. Even though it's coming down today, this billboard is an appropriate way to kick off New York Fashion Week. Even the most picked-over flea market selling pricey goods on a blistery cold afternoon can turn up a treasure even if it's noting more than a snapshot from more than 40 years ago. This little find is slightly out of focus, but it immediately drew me in not so much for the subject squeezing the stuffing out of a Santa Claus but because of the quirkily shaped tree placed against a wooden paneled wall that reminded me of Christmas celebrations at my grandmother's house when I was a child. The more I gaze upon this image, details pop out: the modern design of the three wise men tacked on the wall, the ornaments and tinsel placed willy nilly on the trees' branches and the date indicating that this snapshot was taken on the very first day of the 1970s. Then I began to think about this image's subject. She might be someone's mother or aunt or best friend. Or she might be a neighbor who had nowhere else to spend New Years Day. I imagine she grabbed the Santa to pose with her, feeling slightly uncomfortable having to take her photo alone. And then I wonder who might have taken her picture. A brother? A cousin? Or maybe even a complete stranger...just like the one who picked up her photo and took it home more than four decades later. 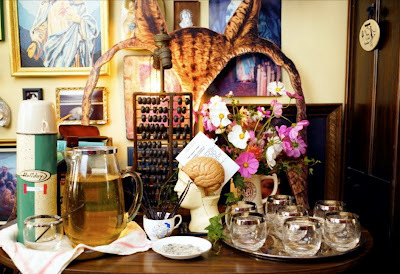 When I hit the thrift stores, I usually have a mission in mind, whether I'm styling a space or shopping for gifts. But this time when I wandered into Vintage Thrift, one of my favorite New York City thrift haunts, I was just browsing. 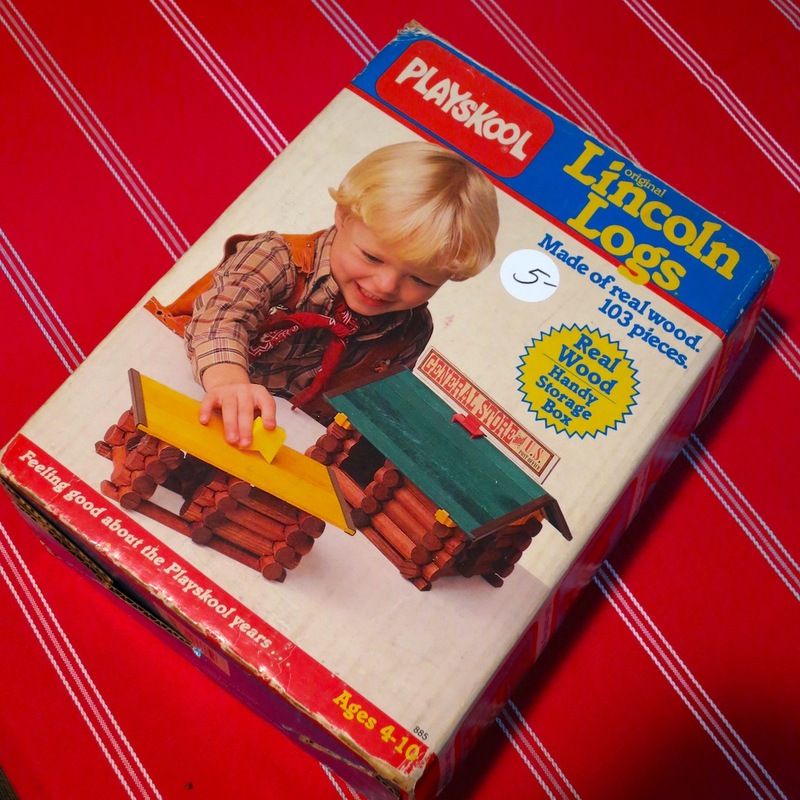 And as you can tell, I browsed right on over to this box of Playskool Lincoln Logs from 1989 and snapped them up for $5. And, of course, I had to put together these little buildings myself! Color is a great unifier of when dealing with objects of dissimilar shapes. Back in November, I snapped this example of fragrance bottles and vases coated in white and displayed as a collection of objets d'art in a Parisian shop window on the rue Vielle du Temple. Can you spot your favorite scent? 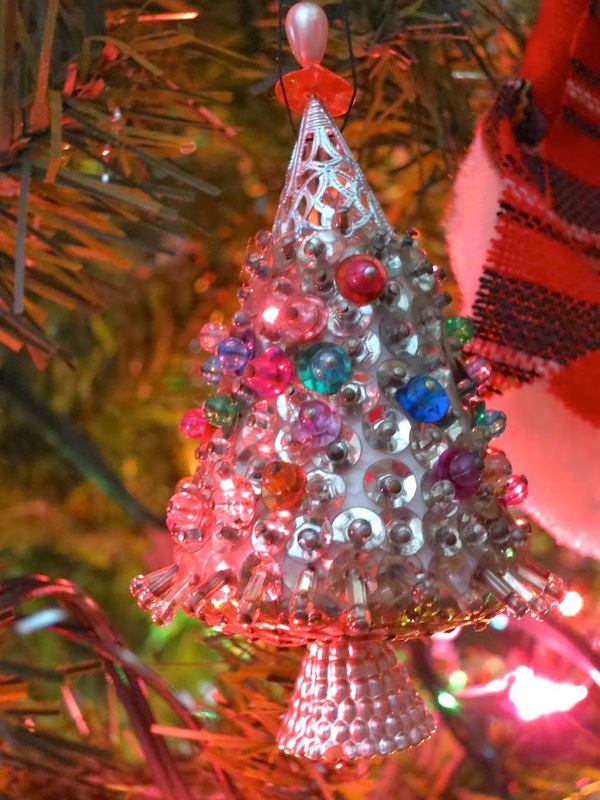 When I go back home to Independence, Missouri, to celebrate Christmas, can always count on my parents' tree to be covered with memories in the form of ornaments my sister and I made when we were kids. There are sequined Santa boots, beaded Christmas trees and all sorts of satiny sparklers dangling from its branches. 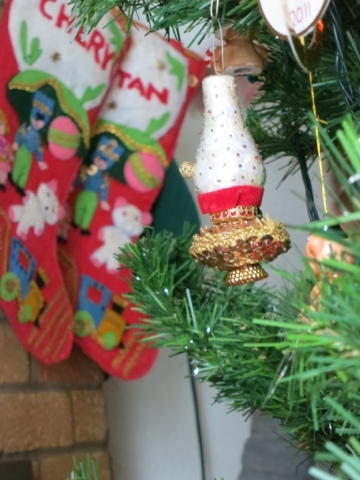 And next to the tree by the fireplace hang the stockings we made when we were in grade school. No matter the economy or the mood of the year gone by, they are always stuffed over capacity, often so abundant that they slide off their hooks to a pillowy thud. May your new year be filled with health, prosperity and happiness!